From the Hawkesbury Institute for the Environment at The University of Western Sydney. Science Meets Parliament was truly an “awesome event and eye-opening experience”. 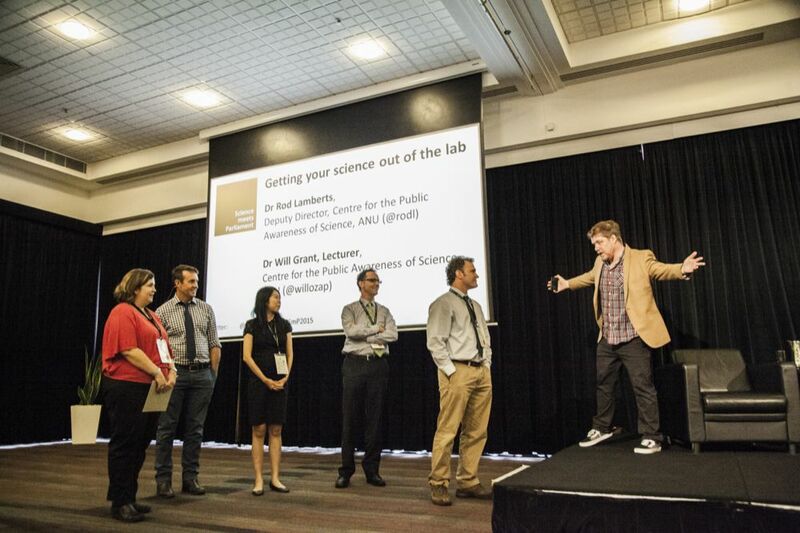 On the 24th to 25th of March, over 200 scientists representing the “science” of life from plant biologists to chemists, physicists and mathematicians all converged in Australia’s capital city of Canberra for two days to learn about how politics, policymaking and the media work. The event provided a unique opportunity to examine science from different perspectives through facilitating a greater understanding between scientists and parliamentarians, stimulating discussions in parliament of scientific issues that underpin Australia’s economic, social and environmental wellbeing, and even more so solidifying deeper understanding of science through the wider community to further the interests of the nation. 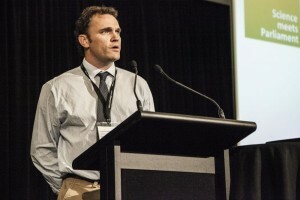 I was fortunate to represent The Australian Society of Plant Scientists while attending this annual event, which was on my “bucket list” of things to do as a scientist. Why? I am passionate about improving my skills in the art of effective communication. It seems imperative that scientists have a prominent voice in parliament that flows with excitement to support long term Australian research and provide effective ideas to engage our fellow politicians and policymakers in a language they can understand. I hoped that by immersing myself in parliament I could develop a more realistic perception of politics and perhaps harness some skills to share with readers of the ASPS as well as my colleagues at the rapidly growing Hawkesbury Institute for the Environment at The University Western Sydney. The overarching theme of the two-day program was to prepare each conference attendee for an interview with a politician in parliament house. No stress, easy done, I think not! How would you handle meeting Prime Minister Tony Abbott, Honorable Minister for Industry and Science Ian Macfarlane, or perhaps the amusing likes of Member for Kennedy Bob Katter or even Greens Senator for Victoria Janet Rice? If you wanted to give a positive and effective impression, my guess is that such a task might be more difficult than one anticipates. What seemed stressful at first was made easier after two days of preparation. Surprisingly, fellow conference attendees who were lucky to meet the aforementioned politicians all came back from their interviews with pleasant experiences and a new appreciation that politicians were normal people with the best intentions of our country at heart. Now that was unexpected and Science Meets Parliament is about preparing for the unexpected so that a scientist’s voice is heard, understood and effective in promoting change. So here is how they managed to get us ready over two days of stimulating panels, discussions, talks and engaging interview simulations. The first day started with a session on how to meet the media, where we learnt more about a day in the life of a reporter. Now their day might be as boring as that of a scientist, except when the “perfect storm” arises with data that grabs the average reader’s attention. What made the NCRIS funding story recently so hot in comparison to that of an endangered ecosystem is that jobs were at stake, the significant level of funding to be cut and an essential interview with Nobel laureate Professor Brian Schmidt, which pieces all the ingredients together to provide the golden story. So how do we get the media’s attention with a “good story”? You need conflict, human angles, policy issues, party angles, economic wellbeing, general interest and good reading. The ultimate judge is the consumers, and they will ask “what is in it for me” or “why should I care”? What is the headline? Can I explain this to my mum? Is it broad reaching? What sources of media should one use to promote the story? These are questions to ask as a scientist when trying to sell the media a meaty story. Next we were exposed to the art of a successful political meeting by a panel of experts. Essentially the “rule books have been thrown out” and reform is hard to achieve. We were encouraged to become proactive as scientists and approach our local members with solutions. We should highlight a political cost if the local members do not respond to science-based evidence that can shape a political arena. It is always good to engage the local member with a personal interest and help them identify the stakeholders. A good meeting with a politician should have three clear points, one action, and most of all is convincing as well as emotional. Invite them to your work; take them on a journey that aligns your agenda with their parties’ future by identifying vote winning “hot buttons” to push. The focus of any meeting should have an outcome and the message can be challenging to convey in 5 minutes or less if they have a busy schedule. The messy nature of policymaking presented by Mr Martin Hoffman (Deputy Secretary of the Department of Industry and Science) was our next lesson of day 1. Too often policymaking was “seen as ad hoc, left to chance and individual skills” and acted upon by events of crisis or when internal reform is necessary. It was said that “policy is separate to politics” and that “good policy is good politics”. Politics is a view of values whereby policy is responsive to politics, but needs to be an enduring agent. Scientists need to realize that science-based evidence can facilitate better politics. The take outs of this session were: 1) beware of being a philosopher king as values and choices in society are the key, 2) policy is about tradeoffs and how do we know when we have spent too much on science, 3) timing is important and when “the window is open” the policy is ripe to change, 4) beware of the misuse of science as science-based policy is best and we should avoid policy-based science and 5) policy is about dealing with constraints which are truly binding. Professor Graham Durant (Director of Questacon) told us about who is inspiring Australia. Apparently, we as scientists are inspiring Australians and need to push positive communications throughout the community. It was pointed out that scientists serve society and we shouldn’t take public support for granted. The good news is that 40% of Australians were aware of National Science Week in 2013. We need work exchanges to bring science into the media to exchange ideas, perhaps through a science media resident program. We should be promoting a creative and entrepreneurial culture that is more cohesive to draw scientists together and we need to learn how to communicate stories more effectively. This is not just the job of Science and Technology Australia, it is our responsibility too. Professor Brian Schmidt and Prof. Hugh White taught us how to talk and think like a policymaker. It became apparent that policymakers are not after the truth; they just want to make decisions. As John F Kennedy said “To govern is to choose”. So it is better if, as scientists, we give policymakers knowledge and assist them in making decisions. It is far less effective to say “I know something and you need to change your policy”. Professor Schmidt said that we should not “underestimate your ability to influence politicians”. Objectives are usually always dependent upon resources and policymaking is a dynamic process that scientists need to participate in if we are to make a difference. There will be bouncing between facts and decisions and it is important to work with them and talk a language they understand. At this stage I felt that we needed to become advocates of business science as “advocacy is driven by analysis”. Nobody owns a result in policymaking; you throw out ideas and knowledge and have to be open to criticism. Most politicians apparently want a positive outcome and “good policy really does matter”. It was made clear that we shouldn’t talk about opinions, but rather how experts can support policymakers with facts that are balanced with a public view. We closed the day learning how to get science out of the lab. We were required to undertake a simple, yet not so simple, exercise – to tell our science story in one minute as if we were addressing a politician. After only 5 minutes of such short notice preparation, competitions were hot amongst the conference delegates, first by table, than by corners of the room until delegates had voted their favorite speakers to showcase effective communication skills to the entire delegate conference. 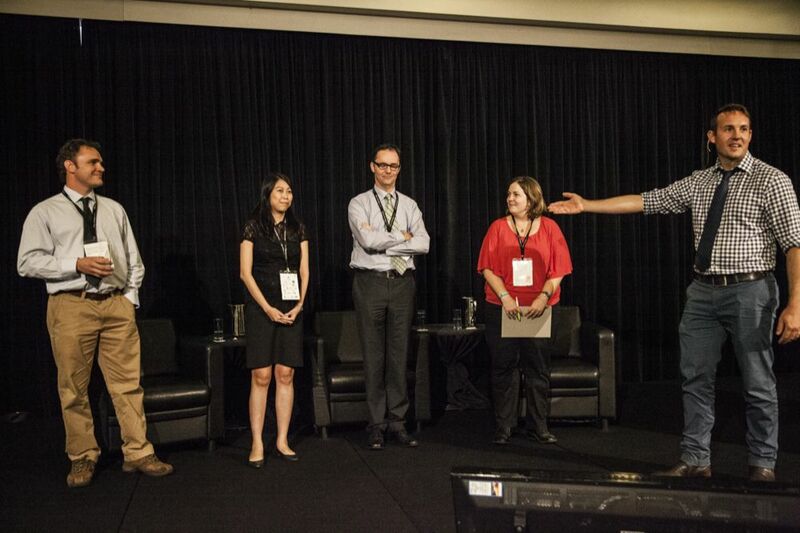 I was fortunate by chance that nobody on my table wanted to present and then selected from my corner of serious competitors to join the final four on stage. It was a tough task trying to rapidly condense my molecular interests in plant science into one minute, with little practice and have it reveals enthusiasm, thrive with passion and tell a scientific story about how plants can perceive and acclimate to a “green thumbs touch”. The final four one minute presentations can be viewed on the YouTube Channel “Getting your Science out of the Lab” (https://www.youtube.com/playlist?list=PLkWrR8YYDTgDuqa5N2hobFd1OUNscW1Zm). The exercise was not about winning or losing, but rather it forced us scientists to explain what we do in simplistic terms that a politician or policymaker can understand. I suspect we all found this challenging, but what we really learnt is just how important effective communication skills are in the process of dealing with politicians, policymakers and most importantly convincing the general public about how important science is to Australia’s future. The Gala dinner that night at Parliament house was absolutely superb and the speech by Honorable Minister for Industry and Science Ian Macfarlane touched base with plant scientists in his highlights of how important agriculture is to Australian exports. Professor Ian Chubb reinforced these comments at the National Press Club Address the next day. He spoke about the face of climate change and addressed that in order to feed nine billion people in the world by 2050 we need to invest in agriculture. He highlighted the importance of plant science as a means to improve yields and be responsive to the 2050 needs by making sure we have the right crops in the right areas as weather patterns change. He was questioned about the GMO debate and pointed out that experts need to communicate more effectively and facilitate the debate. He expressed that we need to have the three P’s for success; “passion, persistence and patience”. It is easy to scare people with myths or skewed stories, but the GMO debate has not been dealt with well. Professor Chubb saw that GMOs have a place and we need to have debates to inform the public and decide what it may look like in the future when dealing with feeding a hungry world in 2050 and combating climate change. He also pointed out that we need better high school education and to nurture student curiosity in science. We need to broaden the education system beyond science to prepare for the future and pointed out that all university students should be enrolled in at least one core subject of science. Finally, we heard Ian Chubb release an important report about the impact of physics, chemistry and mathematics on our economy. They directly add $145 billion to the Australian economy each year ($292 billion indirectly, equivalent to 11% of GDP) and 760,000 jobs (7% of all jobs in Australia). Science needs to be seen as an investment and the economic studies are serving as a platform to argue for long term funding to facilitate infrastructure as well as changes in policy. We as Australians are contributors and users of knowledge. As an example, he highlighted that the rates of return ($700-900 million) in agriculture are the highest of any government investment in science. To meet trade agreements we need to predict weather patterns, rainfall and look for crops and nutritional high yielding plants that are better suited to areas impacted by climate change. The overall view to support the present with an eye to the future is looking extremely bright for plant scientists. Let’s hope the government invests in a greener future focused on agriculture with a long term investment strategy. Thanks to Lorna Sim for supplying the photos which have been made available for publication as outlined by Gia Metherell (Events & Media Officer) from Science & Technology Australia.